Who'd have thought the America's Cup rematch round the island would be so exciting? Who would have believed that the two-boat race round the island that was the centrepiece of the 1851 Cup today between Team Origin and BMW Oracle could have been so exciting to watch? It was a great spectacle with plenty of action – penalty turns, a blown spinnaker and one lost overboard, not to mention four lead changes all in the first 50 minutes alone. From the pre-start manoeuvres and the gybe set start it was compelling. 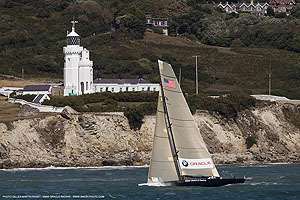 BMW Oracle got away first with a rapid hoist but within minutes Team Origin had hauled past and the scene was set for an action-filled leg down the eastern Solent. The atmosphere was salty – literally. Scores of spectator boats churned up the water, creating a miasma of salty haze. 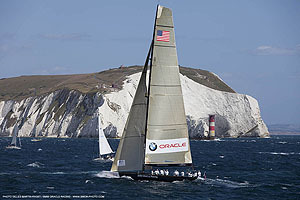 BMW Oracle gained the lead, lost it again after they tore their spinnaker and then TeamOrigin had a disastrous takedown at No Man’s Land fort, trawling their kite under their keel. Someone from the crew appeared to go overboard in an effort to untangle it and in the end they were forced to resort to a crash boat retrieval. The photo above shows the manoeuvre in the early stage of going wrong. You can see that BMW Oracle wasn’t even in shot at this point, but before long they’d overhauled their rivals and the Brits never got back. 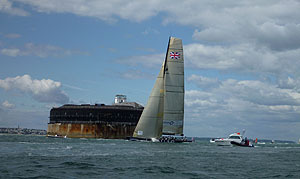 After a restart at Hurst Castle there were more woes for Ben Ainslie’s crew as they fell back even further. 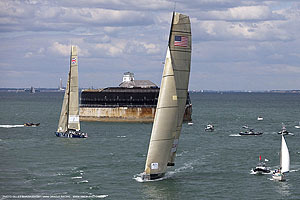 The Americans conclusively won their second consecutive match race round the island in 159 years. 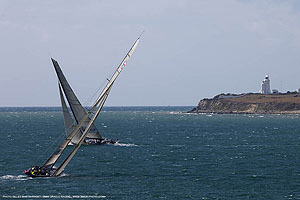 At a rhumb line course length of 60 miles this is probably the longest race since the very first America’s Cup. 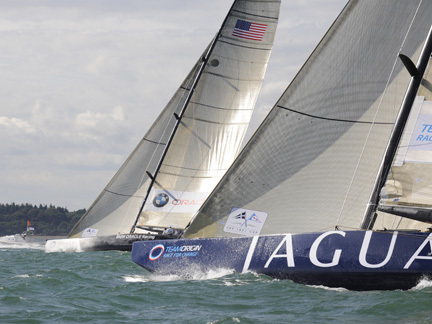 The lengthiest races in recent times were in this year’s America’s Cup when the BMW Oracle and Alinghi multihulls were doing windward-leeward courses totalling 40 miles. 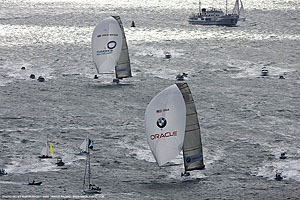 Here a taste of the action: some superb photos by the great Gilles-Martin Raget, official photographer for BMW Oracle.